I recently attended a networking event where the speaker was commenting on pricing and in particular on raising prices even in difficult economic times. He was a man after my own heart! Many company owners I meet are scared to increase prices and indeed are too ready to discount in order to ‘win the business.’ However are they sure of that? Are they fully aware of the damage it does to their bottom line? The following graphic illustrates this well. 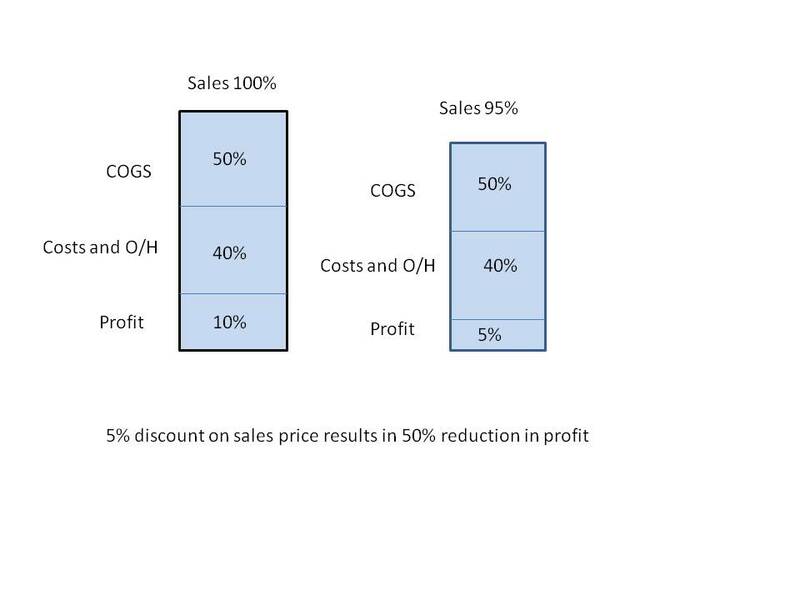 This graphic shows the effect of a 5% discount has on profits in this example. By discounting just 5% on sales price, profits are halved. Prices should not be based on a cost plus model. This is the way most small business work out what to charge their customers. They take their costs to make or provide the product or service, add their overheads and then add the margin they want to make. This frequently leads to prices that bear no resemblance to the prices that the market is prepared to pay. It is markets that set prices. And many companies end up leaving money on the table if they price on a cost plus model. To set market prices you need to have an understanding of the products and services your competitors provide and what they charge for those product. You then need to assess where your product fits into the market. Do you provide better service or are your products of higher quality? If so do not be afraid to charge higher prices. After all would you expect to pay the same price for a Rolls Royce as you would for a Skoda? Each year you should review your prices to ensure that you maintain your profitability. Customers do expect price increases when costs increase. Currently with inflation at 4-5% your profits are being eroded rapidly as the effect of inflation is similar to giving a discount. So always make sure you review prices at least annually. You cannot make up for opportunities lost.